Fast forward to the present day and I don’t even change my own oil anymore. Cars have become computers and more complicated, therefore the idea of doing my own maintenance while possible is much easier to outsource. There are so many things like that today. Complexity of many systems within our world have changed us from capable amateur mechanics to people in the waiting room in anticipation of someone else fixing our problem. While this may be helpful or even necessary with many of our possessions, it seems to have become pervasive to the point of a cultural norm. Day care, personal trainers, landscapers, etc. are all examples of outsourcing things that used to be done by the amateur ‘owner’. While these services can be helpful and possibly ‘necessary’ in a modern context, there is one thing that we can never turn the complete management over to someone else: your mind. The best therapist in the land can be employed for multiple hours each day and still, it is on the individual to get their hands dirty and do the work. No one can change you without your conscious or unconscious consent. Recognizing this fact, I am amazed at how many brain owners keep waiting for the world or their life to make them happy. That is like expecting your neighborhood to take care of your lawn without ever communicating with them about it. And even if you did make that request, I’m sure that you’d get some raised eyebrows or questions like “why is that my responsibility?” So in this area, we need to realize that that amateur mechanic ethos is absolutely necessary. Help is not only desirable in most cases, it is necessary but it is on each and every one of us to maintain, diagnose or even overhaul our mind at times. With the amount of anxiety, depression and other mental concerns that seem to affect most of the population, it is time for all of us to recognize that we are all broken in at least a small way but we are also the mechanic. Learning about yourself, your habits, fears, triggers and so many other components of your mindset is no longer an option. Developing the tools to navigate this complex world is not only your job, it’s integral to your survival. So remember, you’re broken (but so is everyone else) and you’re the mechanic. In 1998 my best friend and I traveled to Europe for the World Cup which was held in France. Despite our main goal being to watch soccer games, we also made side trips to other cities inside and outside of France. One of our stops was the Spanish city of Barcelona. It’s a beautiful city on the coast with the architecture of Gaudi, the shopping of Las Ramblas and hosted the Olympics only a few years prior. Despite all of those magnificent characteristics, whenever I talk about that trip, I usually talk about the Police Department. Let me explain! My friend and I were staying in a hostel* about a mile from the beach. So we usually took the metro from our hostel to other parts of city. On our second to last day in Barcelona, we were at a metro station waiting for the train to come. My friend was rearranging items in him money belt when the train arrived. We hopped up and got onto the train. After the train pulled away, he realized that he’d left his passport on the bench at the station. By the time that we got to the next station and took a train back, the passport was gone. This was early internet days, so we relied on maps and locals to make our way to the US Consulate in Barcelona. Upon arriving there, we realized it was closed because it was a Saturday. The only person there was a guard who only spoke Spanish. Luckily I was able to use my Spanish to explain the situation and he put me on the phone with someone to help. Since we were traveling to France the next day, he explained that we needed to go to the Barcelona PD and file a police report. With that and a copy of his passport, we would be able to cross the border and get a new passport in Paris on Monday. Luckily our visit to the Barcelona PD went off without a problem and we made it to Paris as scheduled. The Barcelona PD is not actually a tourist attraction! However it is one of the places that I mention whenever I talk about this trip. The reason is simple, the destination matters but the road is more important. Almost none of the stories that I tell from my travels are about the view from the Eiffel Tower or standing in front of the Mona Lisa. They are the stories of what went wrong, things that were odd and personal. If the point was to see the Mona Lisa, then Google is all that you need in order to have a fruitful life. To the contrary, the journey to get to the Mona Lisa is more relevant and full of impact. We spend so much of our lives chasing goals and that is clearly the point. Goals are merely the excuse that we have for going on a magnificent journey. The mistake that most people make is that they forget to enjoy the journey. Every day is your chance at adventure. If you choose not to see it, then you will be swallowed up by all of the petty and seemingly insignificant crap that you encounter. Or maybe, just maybe going to the Barcelona PD could be one of the best times you’ve ever had! *If you’ve never traveled abroad, a hostel is like a VERY bare bones hotel. You sleep in a room with many other people and have shared bathrooms etc. Geometry was probably one of the easiest classes for me in high school. Despite its relative ease, I had trouble staying engaged with it. I found it tedious to give all of the reasons why something was true. It was usually pretty obvious whether a problem was going to withstand the scrutiny of the different theorems that we were learning at the time. So it seemed like a relative waste to my teenage self to write out all of the steps in proving or disproving a problem. Especially when the answers (to the odd problems usually) were in the back of the book. In our every day lives, there aren’t a lot of ‘proofs’ to be done. Very few things are black and white. So regardless of how SURE you are of your argument, there’s someone out there with the exact same information screaming the opposite (just think of our present political situation). So if we have nothing to prove, maybe the aim should be to improve. Although there are few cold hard truths that we encounter daily, we do have a sense of who we are personally and what it is that we want for ourselves. So recognize the fact that you have nothing to prove. Even if you were to prove something, the circumstances of tomorrow may wipe away the thing that your proved today. However, each day we have the ability to improve. In small and subtle ways, it is possible for you to see progress in yourself, your life and your circumstances. Almost nothing about you is going to stand the test of time like Pythagoras’ Theorem. That does not mean that your life is meaningless. You are a sand castle that can be improved and enjoyed for the time that it exists. Get digging and sculpting because when the tide comes in, you’ll wish that you had! Cautionary tales like “The Boy Who Cried Wolf” seem to be less prevalent than in the past. Perhaps that is just my perception or my own implementation of life lessons to my kids. I remember exactly who told me this story and for what reason. It had the desired effect. In third grade, I would frequently “not feel well” in order to be sent down to the nurse’s office. Once my visits became frequent enough, the nurse recounted the story of the boy who cried wolf. My visits to her office became more legitimate. Although the moral of the story is extremely clear, it might be worth a revisit because it could go further. In the end, the boy gets hurt because the townspeople don’t believe him. His dishonesty lead to pain because it short-circuited the system that was intended to protect him. While this moral has served me and countless others well, let’s go further. The boy not only put himself in peril, he also robbed himself. He robbed himself of the experience of watching how the townspeople dealt with wolves. His deception was a short term diversion that took away his long term solution. If he had been diligent in his duties, he may have seen that scaring off the wolves was something that he could eventually do on his own. Developing this skill set over time could have saved his life in the future. This revisited moral is possibly even more useful than the original now. The world is full of alarms, warning devices and security systems that keep us safe from “wolf attacks”. However with all of this “protection” are we going to be ready to act when things go sideways. If we are always providing our young people with a “safe space”, will they know how to handle themselves when real dangers show up? Hope is not a strategy. Hoping that the systems in place will be enough to cover all eventualities actually leaves those on the inside helpless. So don’t hope that nothing will happen, take steps to prepare for those possibilities. Systems can be great and it is completely fine that we depend on them, until it’s not. Following the credo of the Boy Scouts, “be prepared!” You don’t know what is coming in your future but if you never consider what’s possible in either the positive or the negative, then you’re bound to be unprepared. We’ve all got exactly one objective in life: FCO (Figure Crap Out!). That’s it! You don’t deserve a problem free life. You can only create one. Not by eradicating all problems but by preparing for so many eventualities that you’re never caught by surprise! 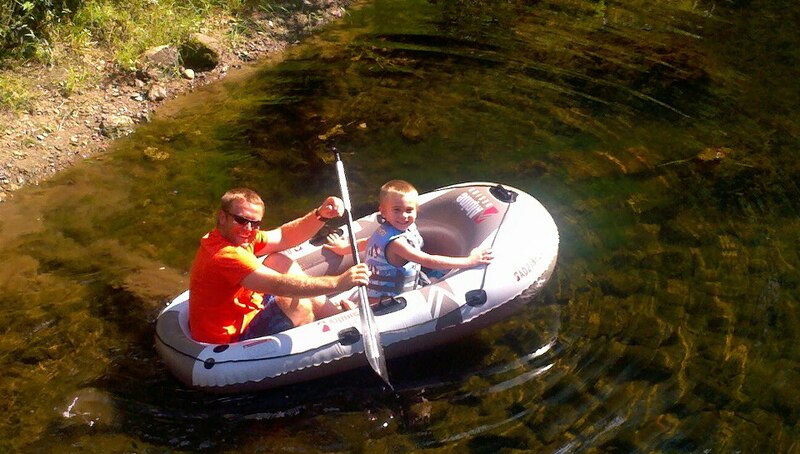 My son and I have taken a few trips down the Musconetcong River in an inflated two man boat. The first two trips were successes. On the third trip, I completely misjudged the river conditions. We ended up popping the boat, walking much of the trip (in and out of the water) and my cellphone ended up getting waterlogged. The trip was not ideal by any stretch of the imagination. As usual we were dropped off at the river several miles from our house and then left to make our way home. The low water levels did not become a true problem until we were about a half hour into the trip. At that point, it is too late to turn back. Luke and I had anticipated a few bumps along the way but we got a full on shipwreck and I’m so glad that we did. Neither of us enjoyed the trek that we made down the river. Half of the time we were in the boat, half we were out and eventually when it popped we had to walk the river without an exit to the road for a while. Regardless of our poor circumstances, we kept chatting and dealing with small problems as they arose. It was not the trip that we wanted but that didn’t mean that we had to hate it. This was not taking lemons and making lemonade. This was slogging and knowing it was slogging but moving forward anyway and not lamenting it. It was something that had to be dealt with. All too often life hands us poor circumstances. In the natural world, lamenting your circumstances gets you nothing. It is only in our overly cushy society that complaints do much to improve a situation. Generally speaking, the world is not interested in your comfort, preferences or desires. It gives you circumstances and you can choose to whine or choose to move forward. A shipwreck is not particularly a death sentence or even a negative occurrence, unless you decide that it is. Cups are an everyday thing that we rarely take much notice of. They are a utility that must have a few very simple features. They need to have walls of some sort and a bottom. Without the bottom, it is just a cylinder. The bottom is the essence of the cup. It does not have to sit flush to the table. It can be raised to any height within the walls that the designer wants. Tops are completely optional. Sometimes they are useful but the majority of cups have no need for a top. It can be helpful to have a bottom in life as well. A set of standards that you will not go below. This bottom should not be a goal but a mental barrier that as you approach it, you start to build back up. Upward movement creates space and the possibility of raising the bottom. Cap the downside first. In life and cups, tops are optional. If you’ve put a limit on what you can be, do or accomplish, flip your perspective and use that top as your bottom. Cap the downside first. Perhaps you’ve already done this or maybe you just think that you have. Regardless having a bottom to your cup is much more important than putting a top on it. Stay away from the bottom and keep testing if there is a top. “Daddy, Watch this!” is a phrase that I heard about two hundred times yesterday. My seven year old daughter was saying it as she performed an underwater back-flip or some other trick in the pool. The consistent request got me thinking about the request. While she was extremely happy to do the trick on her own, it became even more important that she share it with me. The perfection of her delivery did not matter, each attempt was important even the “failures”. As she flipped in the water, I thought about my students, adult friends and myself. We generally primp, polish and perfect everything before we put it on display. The obvious reason for this is a form of fear. We have failure shamed out of us by the time we are teenagers. The unfortunate thing is that failure is a necessary ingredient to all progress. Although public display of failure isn’t particularly necessary, I’m not sure many of us seek out failure in private either. In a society where no one ever fails, we stand still and become spectators watching the same old tired tricks that we’ve seen before. So now what do you do? What do I do? We fail forward. We try to top what we’ve done before with the childlike optimism that we can. Then as we get closer and closer to our coveted goal, we can scream at the top of our lungs “WATCH THIS!” Perhaps we’ll fall on our faces. However I’d rather be face-down ready to try again than be standing on the sidelines with an empty heart and only criticism to offer the world. Mark Painter is one of the best soccer players that I’ve ever played with and he is also a great hurdler. When he was in high school, he could run the 400 meter hurdles faster than I could run 400 meters. That race is exhausting and takes technical skill as well. The experienced hurdler does have one advantage over the rest of us: anticipation. Hurdles are always set in the same distance patterns. So there is a rhythm to hurdling and being in that rhythm is a recipe for success. Imagine for a moment though if the hurdles were set at different distance for each race. Or even worse, imagine if the hurdles were moving during the race. This can be the way that racing toward a goal often feels. We get into a rhythm that seems to be working for us but then we trip on a hurdle that we weren’t anticipating. It can be disheartening and frustrating but life does not set up races to be fair. Life sets up races with a difficulty level that is on par with your goal. The beginning may be clear sailing but you know that the end is going to be filled with hurdles. The trouble is that we don’t usually have the hurdler’s advantage in life. Although there are many hurdles we can anticipate, others will pop up when we least expect it. We need to make much of it up “on the fly” as we go in life. So complaining about how life tripped you up is not going to get you anywhere because life’s race continues regardless of your complaints. Know yourself as best as possibly can and run with a realization that the hurdles are coming. If you truly want that thing at the finish line, you’ll find your way through the hurdles. This statement has been a major ingredient in many of the decisions that I’ve made throughout my life. Although we live in a world where it is widely believed that “nice guys finish last”, I’ve never regretted my decision to follow this ideal. The only issue that I have with the statement is that some people tend to focus too heavily on the last part. The key to the world is give and take: exchange. We live in a world that is based on currencies and they are exchanged regularly. Some currencies are physical, like money or products. Some currencies are emotional like love and respect. Since most of our thoughts on exchange revolve around purchases, we want instantaneous results when we give out a currency. This is a system that we understand in the physical world. The problem is that in many of the invisible currencies, exchanges are not direct. So people, who were not raised by my father, may read this statement expecting that their niceness will be rewarded soon after it is given. The thing that I learned by seeing the application and not just listening to the words was that you need to be willing to give with no thought to receiving. I would almost cut off the last part of the saying but no one does anything without a reason. My belief in the eventual payoff or karma of my present actions is a necessity. Although I never know how or when I’ll see my generosity repaid, my experience tells me that it will be paid back in greater quantities than I gave. There is a common dream that people have where they are a spectator at a sporting event or musical performance. Suddenly something happens and it becomes necessary for them to become part of the game or performance. Inevitably in this dream state, the dreamer is successful in this unlikely circumstance and then they wake up. Personally I’ve had different versions of this dream in the past. The only part that I dislike is the waking up. It’s obviously a spectacular fantasy with no basis in reality. Especially at my age, I’ll never make it as a professional soccer player and I don’t even play an instrument. The allure comes from the sudden and unexpected success. To go from zero to hero in the blink of an eyes is the dream of many. The question that I have for myself today is “what if the waking up is the best part?” Maybe by waking up after that glimpse of impossible hope we could take a step forward in the real world. I’m never going to make it as a pro soccer player, this is true. However there are many other dreams that my inner spectator can move toward right now. But it’s not going to be a zero to hero moment. Very few things in life ever are and why should that be the goal to begin with? Most lottery winners end up bankrupt because they can’t handle the transition. The spectator’s chance is in the waking up! Realizing that it won’t happen in a moment. And DOING IT ANYWAY!